We bought out 21.5” Apple iMac earlier this year and couldn’t be happier with it. As an avid lover of free software, I have been slowly accumulating free apps for various stuff for Mac OS X.
I was going to write a list of apps I use and was surprised when I came across this Lifehacker collection of Free Mac OS X apps. A lot of the apps I am using are in this list. QuickSilver – a Launchy like application launcher app that provides easy access to apps, files, iTunes, etc. Bean – Free alternative to editing Microsoft Word files. Open Office is a much more robust solution depending on your needs. Notational Velocity – Fast and free note taking app with search, tags, etc. Firefox/Chrome – Very capable alternatives to Safari browser. Fluid – Create desktop-like apps for web apps complete witg Growl-notifications, Dock badges, etc. Burn – A nice alternative to OS X’s built-in burning capabilities. The Unarchiver – Another nice alternative to to the built-in utility. Dropbox – One of the best file multi-OS sync utility with a generous referral program that can increase your free 2GB account. TrashMe – if you want to really clean up after deleting an app, TrashMe is your best friend. WineBottler – Drop any windows .exe file to install and run on Mac. VLC Player – Plays any media format you can throw at it. A must have. 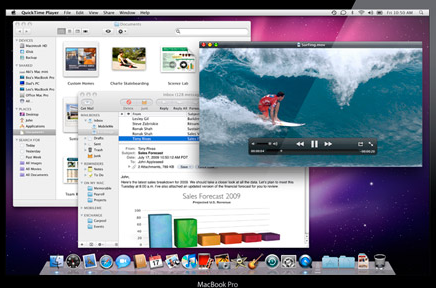 Handbrake – One of the best video converter apps to make your media files compatible for various devices. Do you have a few free apps of your own, share it in the comments.